Penn State World Campus ranks #1 on The 20 Best Online Bachelor in Marketing Programs! Arizona State University ranks #2 on The 20 Best Online Bachelor in Marketing Programs! With well over a century of experience to its name, the W.P. Carey School of Business at Arizona State University offers undergraduate, graduate, and professional programs built on a long history of tradition in the field. Through eight departments, including the Department of Marketing, the School of Business covers a diverse array of business fields. The School of Business further serves the needs of future professionals through flexible online programs, internship and scholarship opportunities, professional development services, and research and outreach programs, such as the Center for Competitiveness and Prosperity Research. Through the ASU Online platform, the Department of Marketing offers an online Bachelor of Science in Marketing degree program for students seeking to enter or advance professional positions in the marketing field. The program develops a balanced foundation of knowledge in key areas of marketing, including brand management, integrated marketing communications, marketing research and analysis and applications, understanding consumer behavior, and more. University of Alabama at Birmingham ranks #3 on The 20 Best Online Bachelor in Marketing Programs! The Department of Marketing, Industrial Distribution, and Economics offers an online Bachelor of Science in Marketing degree program for students seeking to enter the marketing field. The program develops a balanced foundation of knowledge and skills necessary to a variety of marketing professions. Through a blend of in-depth coursework and hands-on research, students engage with key components of the field. The curriculum covers topics such as integrated marketing communications, market research and applications, consumer behavior, international marketing, and more. Students prepare to pursue a variety of careers, including market research analyst, marketing manager, content marketer, promotions manager, public relations specialist, and sales manager. The Association to Advance Collegiate Schools of Business (AACSB) accredits the Collat School of Business. The Southern Association of Colleges and Schools Commission on Colleges (SACSCOC) accredits the University of Alabama at Birmingham. Colorado State University Global Campus ranks #4 on The 20 Best Online Bachelor in Marketing Programs! Indiana Wesleyan University ranks #5 on The 20 Best Online Bachelor in Marketing Programs! Indiana State University ranks #6 on The 20 Best Online Bachelor in Marketing Programs! University of Minnesota, Crookston ranks #7 on The 20 Best Online Bachelor in Marketing Programs! Regent University ranks #8 on The 20 Best Online Bachelor in Marketing Programs! Fisher College ranks #9 on The 20 Best Online Bachelor in Marketing Programs! Regis University ranks #10 on The 20 Best Online Bachelor in Marketing Programs! Minot State University ranks among The 20 Best Online Bachelor in Marketing Programs! Northwest Missouri State University ranks among The 20 Best Online Bachelor in Marketing Programs! California Baptist University ranks among The 20 Best Online Bachelor in Marketing Programs! 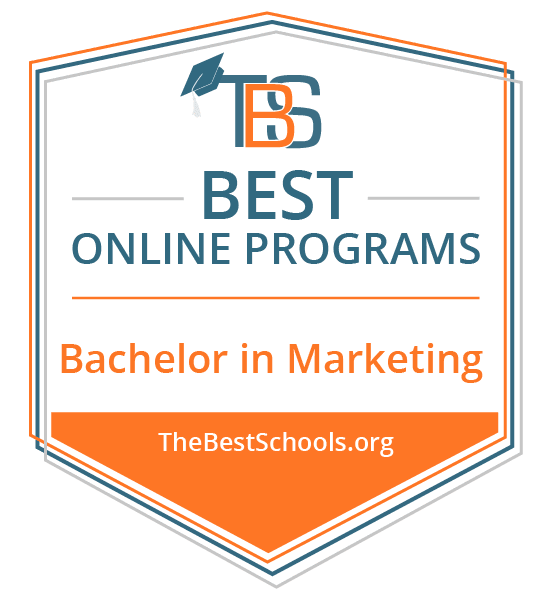 University of Maryland University College ranks among The 20 Best Online Bachelor in Marketing Programs! Linfield College ranks among The 20 Best Online Bachelor in Marketing Programs! Huntington University ranks among The 20 Best Online Bachelor in Marketing Programs! Concordia University, St. Paul ranks among The 20 Best Online Bachelor in Marketing Programs! Grand Canyon University ranks among The 20 Best Online Bachelor in Marketing Programs! Northwood University ranks among The 20 Best Online Bachelor in Marketing Programs! Post University ranks among The 20 Best Online Bachelor in Marketing Programs! Given the importance of effective marketing to corporations of all sizes, marketing professionals have a range of salaries, based on their ability, place of employment, and level of experience. The following information, sourced from the Bureau of Labor Statistics, reflects median annual salary information for 2016 of three common marketing professions, as well as job growth outlook information for 2016-2026. American Marketing Association (AMA) – Formed in 1937, the AMA boasts membership of over 30,000. Dedicated to promoting excellence in the field, the AMA provides members with a variety of useful benefits, including access to publications and market analysis resources, conventions and events, and a large professional network. Society for Marketing Professional Services (SMPS) – Since 1973, SMPS has grown to include a network of nearly 7,000 members from diverse professional fields. With the goal of advancing knowledge and practice in marketing, SMPS membership comes with a variety of professional services, access to publications and resources, conventions and events, and networking opportunities.